Crumb rubber is recycled rubber that is cut into tiny pieces and spread on playing fields and playgrounds. On playing fields it is typically covered with artificial turf, but on playground may be used as an alternative to mulch, or laid as a smooth surface. 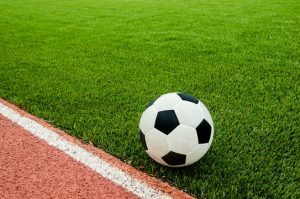 Crumb rubber is used on these playing surfaces because it is springy and protects people from injury when they fall, provides a flat surface, requires minimal maintenance, and no watering or pesticides. Why are some people worried about crumb rubber? Since it is recycled from other rubber products, crumb rubber can contain a variety of organic compounds and metals. Some people are concerned that users of synthetic fields may be exposed to these chemicals through, skin contact, accidental ingestion, or inhalation. People are also concerned that rain may move chemicals into groundwater that is used as potable water. In addition to questions about chemical exposure, some players complain that crumb rubber surfaces are hotter to play on than grass turf, cause skin burn following sliding on the fields, and increase chances of infections. At this point research has not shown any conclusive health effects from playing on crumb rubber surfaces, and this issue is still being studied. 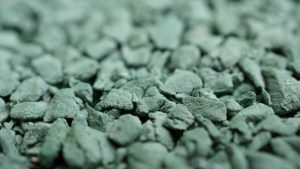 The Environmental Protection Agency (EPA) in coordination with the Center for Disease Control’s (CDC) Agency for Toxic Substances and Disease Registry (ATSDR) are investigating whether crumb rubber might be harmful in their “Federal Research Action Plan on Recycled Tire Crumb Used on Playing Fields and Playgrounds”. They expect to publish their final report in summer of 2017.